Cooper the Havanese puppy at 9 months old in a puppy cut—"His hair looks like human hair, especially when it falls to the ground after being cut." 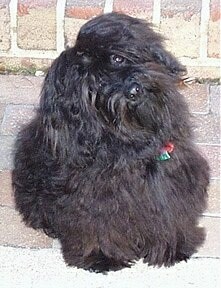 "This is Ziggy, my pet Havanese at 15 months old...loves to play at the "leashless" park and goes to Bow Wow DogCare 3 days a week. They call him The Boss of Daycare. None of the large breed dogs bother him and if they do, Ziggy promptly corrects them; Ziggy is very confidant. He is definitely a "momma's boy"!" 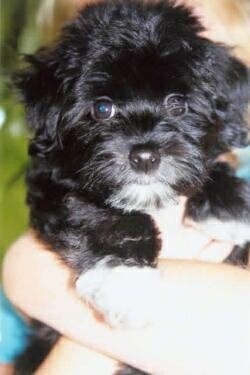 "Chica Jr., our Havanese puppy is almost 9 months in this picture. She is all grown up and cuter than ever. She loves to have fun and travel everywhere by airplane or boat or a car. She enjoys every moment of it. 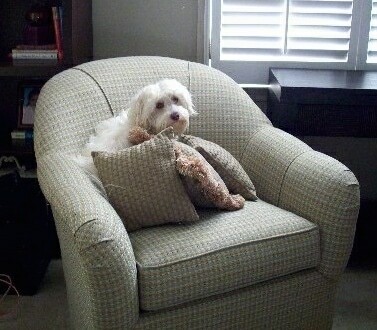 Chica Jr. is so spoiled, shredding paper is one of her favorite things right along with stealing a sock or two." 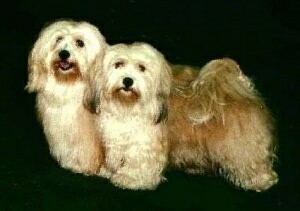 The World Famous Multi Champion Mucho Bravo Wild Willy (left) with his daughter Multi Champion Mucho Bravo Spectacular Red (right), photo courtesy of the Dutch Havanese Homepage "Mucho Bravo Havanese"